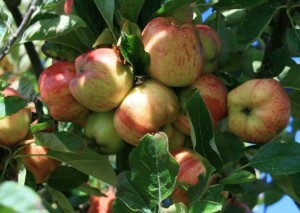 I have to confess, when it comes to the orchard, other than pruning, I’ve pretty much let the trees fend for themselves. This is a disgraceful admission, being as I spent many formative years in eastern Washington, arguably the apple capital of the world. Traditionalists in this region rely on a lot of sprays to obtain efficiency of scale and the perfection demanded by a discerning public, defined as “quality.” Apples are, after all, big business. 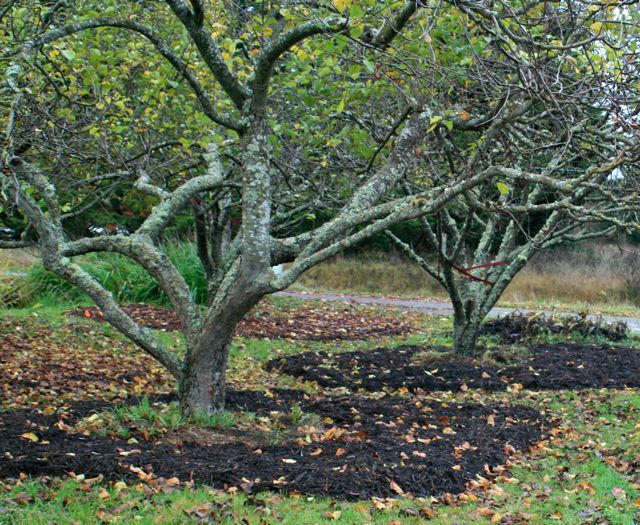 I have never quite been in tune with this philosophy, but haven’t known exactly what to do instead to keep an orchard healthy and productive – or whether, for that matter, anything need be done at all. I fondly remember an old apple tree that grew in a gully where I used to ride horseback; it must have been at the site of an old homestead, but there were no other signs for miles around. That tree had the best apples ever. I have no idea how old the trees are exactly, but I would put them in the “senior” category. We’ve lived here 17 years now, and when we moved in, they were already gnarly. 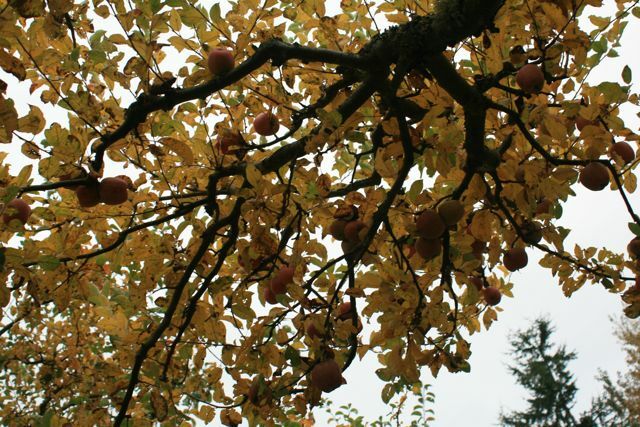 Their branches were a neglected tangle of consequences from mixed opinions about pruning or lack thereof. Bit by bit, I have shaped them to let the air and sunshine in and have attempted to reach a vision of balance. In the process, I’ve gotten to know each tree for the unique individual it is. I am accepting of imperfections. I am not offended by a little blemish here and there, nor am I opposed to sharing my crop with a few critters, but I have always felt I should be doing something more to help these beautiful trees be all that they can be. And then we got the bees. My views of the trees and of a whole variety of pollinators, not just honeybees, were transformed. We had an unusual spring in which decent weather timed perfectly with the blossoms. 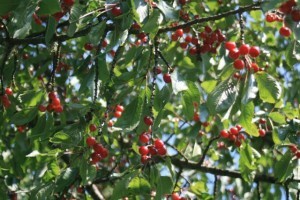 I remember standing beneath the big cherry and it seemed the whole tree was vibrating with the buzzing! The sheer volume of fruit on these trees was mind-boggling. I figure I harvested about 700 pounds of apples from four trees alone. We had more cherries and plums than we had had in years. I am grateful to these trees (and to the bees, thank you!) – but that kind of production seemed almost unnatural! And so here is my quandary: I know I need to give something back. But what? And how? I have been doing a lot of reading about permaculture, food forests, eco-gardening, agroforestry, edible landscaping, polyculture, agroecosystems, and an assortment of trendy phrases that have arisen with what is becoming a movement around the world. 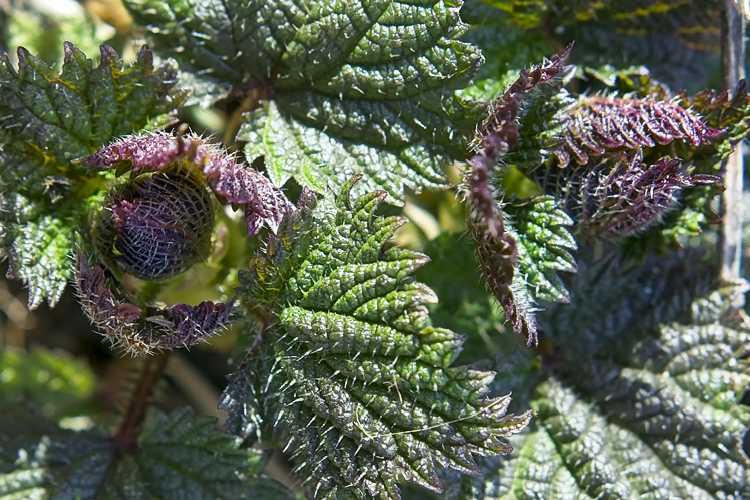 Indeed – it makes so much sense to grow a variety of plants together in a way that encourages each plant to fill a supporting niche, resulting in a stronger whole much greater than the sum of the parts. In Bill Mollison’s words, permaculture is a system of working with, rather than against, nature. 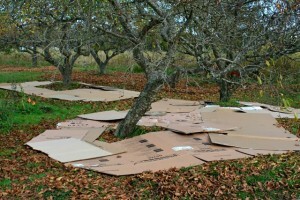 Our orchard is a far cry from the Food Forest I envision. However, if I can build diversity into this system, I can build resiliency. It’s that simple. And also that difficult. Compromise. Although this has not been achieved at even the highest echelons of our government, it is perhaps the main solution, i.e., admitting that perhaps some grass is appropriate – yes, even desirable. Play areas, for example. Pathways might be a temporary allowance. But just so you know, I am not selling out here. No way. Due Diligence. I think of it as keeping on top things. An online dictionary defines it as “A measure of prudence, responsibility, and diligence that is expected from, and ordinarily exercised by, a reasonable and prudent person under the circumstances.” Yes, I’m going to work on that. Reasonable and Prudent. Actually, I threw this one out after the word “ordinarily.” And I hate it when dictionaries use the same word to define what you’re trying to get the definition of, which is why I’m not quoting the source. Next. Clearly, I need help. Have you noticed none of these approaches have mentioned the REAL way to get anything done? i.e., Labor. Enter Michael Phillips, author of The Holistic Orchard. His primary advice seems so obvious: build the soil. When you support the microorganisms in the soil, you support the entire tree. It’s not about killing pests with sprays; it’s about creating an inviting place for partners in pollination and pest control. First: Pick all the fruit and clean up all the ground falls. 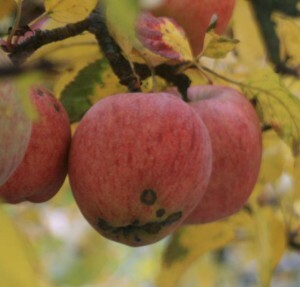 In the past, I always figured apples on the ground provided food for wasps and rodents and eventually just went into the soil; apples left on the trees provided food for birds. Well, if one of those apples has a little apple maggot in it, which then crawls out into the soil, next year, when it hatches out, you might have a problem. That goes, too, for a whole host of other pests, spores, larvae, and diseases. 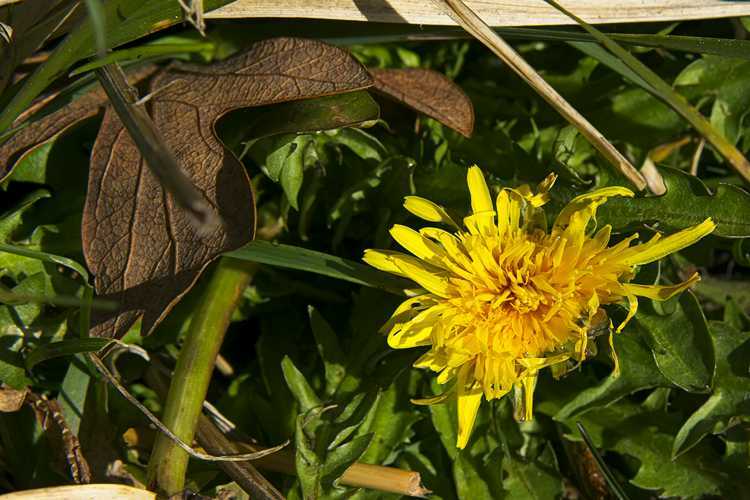 The trick is to disrupt the breeding cycles; don’t provide a place to overwinter. You can always set out some apples later for the birds if they get hungry. Second: Spray the trees. I have always been anti-spray; however, after reading The Holistic Orchard, I am very much PRO-spray. Why the about-face? There is a huge difference between spraying to kill and spraying to nourish. We’re not talking about spraying chemicals; we’re talking about spraying an assortment of nutrient-enriched teas and concoctions for overall health, as well as organic pest control. This was an exciting revelation to me and a great excuse to go out and buy a new tool: a decent backpack sprayer. Ok, this thing set me back $100, but if you want to reach the upper branches, you have to get something that will do it right (I walked past the cheaper ones with Roundup emblazoned in gargantuan black font, not willing to be an advertiser just to save a few measly bucks). Wait until at least half of the leaves have already fallen. Admittedly, I am perhaps not the most desirous of partners after spraying an elixir of Neem Oil and Fish Fertilizer on the trees on what I thought was a calm day (note: take note of which way the wind blows, for even on a calm day, the wind still blows), but I must say, my trees love me. (And so does my dog.) I also sprayed it on the ground around the base of the trees, out to the drip line. The combination of oil & fish increases leaf decomposition, contains nutrients and minerals for both the tree and microbial communities, stimulates immune response, and can disrupt pathogens that might think they can lurk in the bark and crevices over the winter. Neem oil & fish fertilizer, as mentioned above. Well-composted dairy manure: a light application of about a bucketful around each tree to encourage the worms to do their thing. Lime: a good thing to add to the predominantly acidic soils of the Pacific Northwest. Fruit trees like a neutral 6.5 – 7.0 pH. I’ve never added it in the past; it was past time. Fourth: Do nothing – i.e., leave the leaves. You *could* chop them up with a mower, which will speed up the decomposition process. Maybe I’ll do that next year. The main thing, though, is do NOT rake them up, stuff them in bags, and haul to some landfill; do NOT set them on fire and watch all that potential go up in smoke. Take the easy way out: do nothing. Let the worms and microbes do the work for you and turn them into humus. Fifth: Cover with cardboard. Did you know it’s hard to get good cardboard these days? It’s all bundled up for recycling. My advice is to ask the right people before you take something that looks like someone’s garbage. I thought I was saving them a dump fee and repurposing something that would otherwise go to waste. They accused me of stealing. If this sounds like an unpleasant experience, yes, it was, and they can keep their rain-soaked cardboard. Some folks think newspaper works better because it softens to the contours of the land. I couldn’t find any – where does it go? We don’t subscribe. It’s just as well; I am leery of shiny colorful inserts or anything with an affixed window. The thing is, it takes a lot of cardboard to surround a mature tree all the way out to the drip line, so make friends with whatever sources you can find. Sixth: Top with mulch. We are fortunate to have access to “green grindings” at $10/yard (talk to Steve at the Lazy J Tree Farm). Some folks say they can find mulch material for free from arborists. I applied roughly 8-10 small wheelbarrows full around each tree. It was a good workout. And wow. It looks so darned nice! I am sure I will need to apply more mulch in the spring – and there is a good chance the grass will still try to grow through everything – but this is a great start, and I feel I’ve done my part to help the trees get through the winter. Which leads us to step 7. Endnote: Michael Phillips’ book has SO much information, tips, practical advice – I can’t possibly do it justice here. This man is truly a steward of the land. 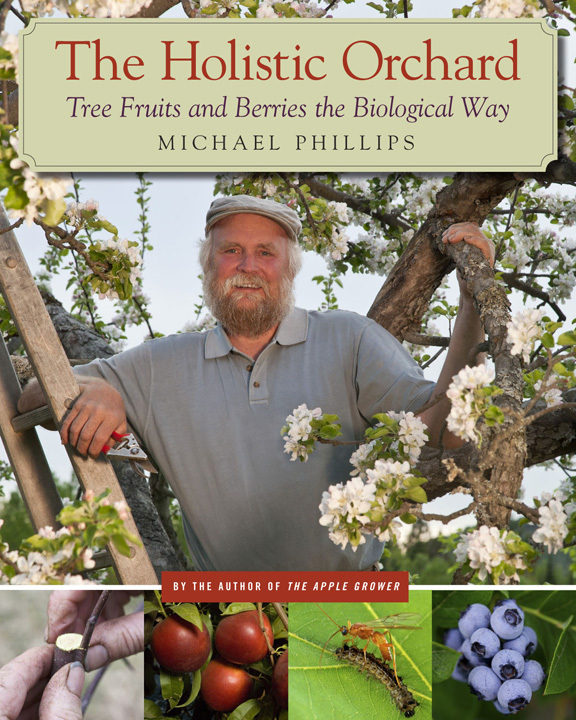 The Holistic Orchard – Tree Fruits and Berries the Biological Way is an excellent reference and a good read.